The Global Volcanism Program has no activity reports for Cerro Pantojo. The Global Volcanism Program has no Weekly Reports available for Cerro Pantojo. The Global Volcanism Program has no Bulletin Reports available for Cerro Pantojo. Cerro Pantojo is an eroded 1897-m-high dominantly basaltic volcano of Pleistocene age along the Chile-Argentina border with a Holocene cinder cone on the Argentinian side (Moreno 1985, pers. comm). It lies SSW of Lake Constancia, which is located immediately west of the Argentinian border, and has a dramatic steep-sided summit pinnacle. Lara L, Rodriguez C, Moreno H, Perez de Arce C, 2001. Geocronologia K-Ar y geoquimica del volcanismo plioceno superior-pleistoceno de los Andes del sur (39-42° S). Rev Geol Chile, 28: 67-90. The Global Volcanism Program is not aware of any Holocene eruptions from Cerro Pantojo. If this volcano has had large eruptions (VEI >= 4) prior to 10,000 years ago, information might be found on the Cerro Pantojo page in the LaMEVE (Large Magnitude Explosive Volcanic Eruptions) database, a part of the Volcano Global Risk Identification and Analysis Project (VOGRIPA). There is no Deformation History data available for Cerro Pantojo. There is no Emissions History data available for Cerro Pantojo. The small volcanic center with the crater outlined by snow just to the left of the bottom center of this NASA International Space Station image (with north to the upper right) is Cerro Pantoja. This eroded basaltic-andesite volcano of Pleistocene age along the Chile-Argentina border has a Holocene cinder cone on the Argentinian side. 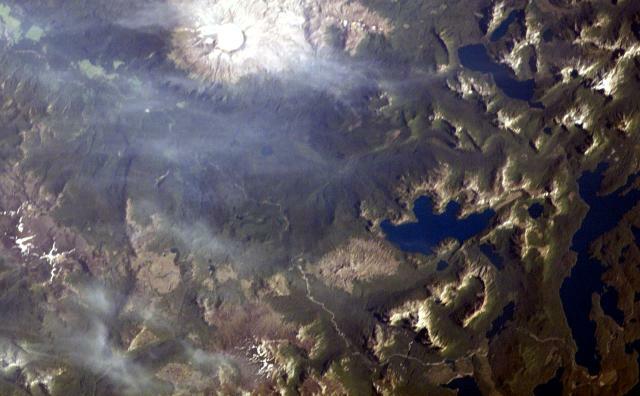 The deep blue lake at right-center is Lago Constancia, and the large stratovolcano with a snow-filled summit crater at the top of the image is Puyehue. NASA Space Station image ISS006-E-40413, 2003 (http://eol.jsc.nasa.gov/). There are no samples for Cerro Pantojo in the Smithsonian's NMNH Department of Mineral Sciences Rock and Ore collection. Large Eruptions of Cerro Pantojo Information about large Quaternary eruptions (VEI >= 4) is cataloged in the Large Magnitude Explosive Volcanic Eruptions (LaMEVE) database of the Volcano Global Risk Identification and Analysis Project (VOGRIPA).